The elemental potassium in Potassium Citrate by New Roots Herbal is bound to hydrolyzed vegetable protein for maximum intestinal absorption. Potassium and sodium are oppositely charged electrolytes responsible for cellular respiration, also known as active transport. The sodium-potassium pump provides the energy necessary for nerve-cell stimulation (reflexes), as well as for the storage of glucose within the muscles and liver. The critical balance between sodium and potassium is often compromised by diuretics such as alcohol or caffeine. The inundation of “hidden” sources of sodium in the average North-American diet often disrupts critical electrolyte levels. Muscle tone, blood pressure, and overall osmotic regulation rely upon adequate levels of intracellular potassium in relation to extracellular sodium. 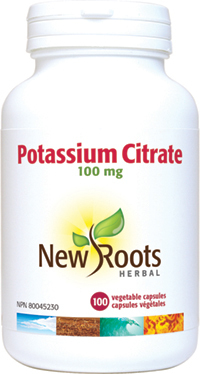 The citrate form of potassium in New Roots Herbal’s Potassium Citrate has superior bioavailability.